A recent report published by Infinium Global Research on fuel dispensers market provides in-depth analysis of segments and sub-segments in global as well as regional fuel dispensers market. The study also highlights the impact of drivers, restraints and macro indicators on the global and regional fuel dispensers market over the short term as well as long term. The report is a comprehensive presentation of trends, forecast and dollar values of global fuel dispensers market. According to the report, the global fuel dispensers market is projected to grow at a CAGR of 2.9% over the forecast period of 2018-2024. Fuel dispensers are the machines used to refill various types of fuels into the vehicles at filling stations. The fuel dispenser’s pumps gasoline, diesel, petrol, CNG, LPG, ethanol fuels, and several other fuels. The fuel dispenser system is a combination of electronics and mechanical systems. The electronics part contains an embedded system, pumps display, and other units while the mechanical system uses an electric motor, pumping unit, meters and other mechanical equipment’s. A rapidly Increasing number of refilling stations to cater the fuel demand is the primary factor driving the growth of fuel dispenser market worldwide. The growing automotive industry and the increasing demand for automobiles across the world are the key factors driving the growth of fuel dispensers market. 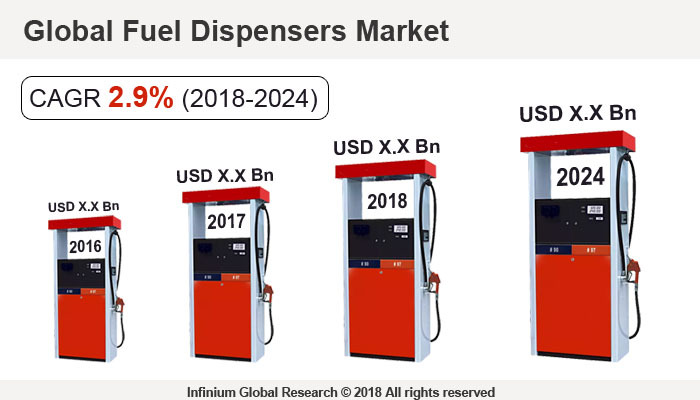 In addition, rising disposable income and increasing consumers spending on the automobiles are facilitating the growth of the fuel dispensers market. The demand for various types of fuel is rising rapidly that is likely to boost the demand for fuel dispensers market. Moreover, ongoing technological advancements, growing oil and gas industries art the factors projected to create various opportunities in the fuel dispenser market over the forecast years. Among the geographies, the Asia Pacific region is the largest and the fastest growing region in the fuel dispenser market. Asia Pacific region has the highest number of automobiles. Also, the rapidly increasing population and growing demand for automobiles in the Asia Pacific Region are some of the factors driving the growth of fuel dispenser market in this region. The report on global fuel dispensers market covers segments such as fuel type, type, and flow meter. On the basis of fuel type, the global fuel dispensers market is categorized into petrol, diesel, compressed hydrogen and CNG. On the basis of type, the global fuel dispensers market is categorized into submersible systems and suction systems. On the basis of the flow meter, the global fuel dispensers market is categorized into mechanical and electronic. The report provides profiles of the companies in the global fuel dispensers market such as Zhejiang Lanfeng Machine Co. Ltd, Scheidt & Bachmann GmbH, Tokheim Group S.A.S, Piusi S.p.A., Wayne Fueling Systems LLC, Neotec, Tatsuno Corp. and Tominaga Mfg. Co. The report provides deep insights on demand forecasts, market trends, and micro and macro indicators. In addition, this report provides insights into the factors that are driving and restraining the global fuel dispensers market. Moreover, IGR-Growth Matrix analysis given in the report brings insight into the investment areas that existing or new market players can consider. The report provides insights into the market using analytical tools such as Porter's five forces analysis and DRO analysis of fuel dispensers market. Moreover, the study highlights current market trends and provides forecast from 2018-2024. We also have highlighted future trends in the fuel dispensers market that will impact the demand during the forecast period. Moreover, the competitive analysis given in each regional market brings insight into the market share of the leading players. This report will help manufacturers, suppliers, and distributors of the fuel dispensers market to understand the present and future trends in this market and formulate their strategies accordingly.